Brown ground beef, onion and garlic, add salt and pepper for taste. Boil noodles according to package, I leave it a little chewy, it will cook the rest of the way when baked. Mix cottage cheese, egg, spinach, italian seasoning and parmesan cheese, set mix aside. Once the meat mixture is cooked, add the jar of spaghetti sauce. Spray a deep 9×13 pan with non stick spray. Put a layer of noodles, overlapping noodles until entire base of pan is covered, layer 1/3 of the cheese spinach mix, then 1/3 meat mix, and 1/3 of the shredded cheese…repeat 2 more times. 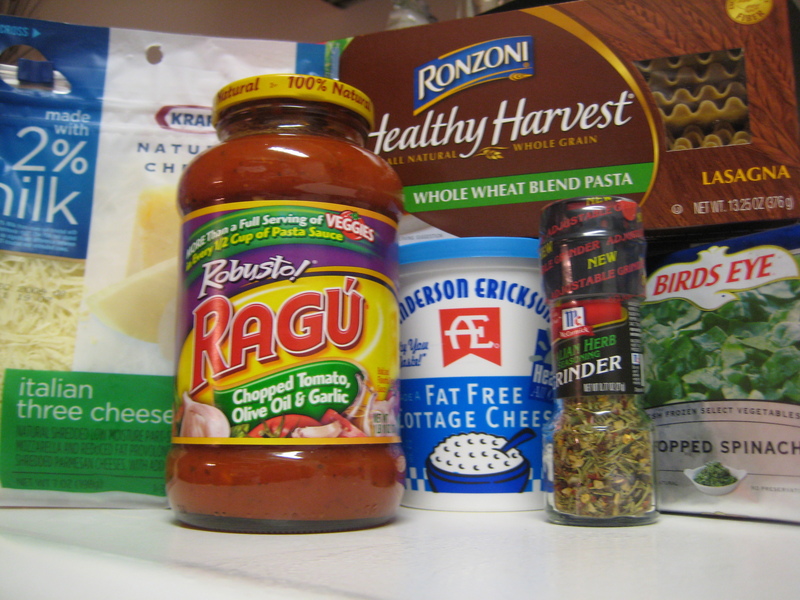 Once the final layer of cheese is on, sprinkle top of lasagna with italian seasoning. Bake for 45-60 min on 400 degrees or until bubbly and golden brown. Once done let rest for about 5-10 min to set. But I do feel like I am entitled to some chill time. I have been busy busy busy these past 4 days. My Thanksgiving festivities started on Wednesday night with church with my family. Thursday was traditional Thanksgiving with my parents. Friday I CLEANED all day then had my family over for Dat Seen, crab rangoons, eggrolls, and shrimp rolls (dat seen = we all cooked around a griddle on the table…sooo gooooood). Saturday, Joe and I went down to MO for his family’s Thanksgiving, and drove back. Although very busy, its been wonderful and I wouldn’t have it any other way. I am off to prep my lasagna for tonight. A very healthy easy lasagna to make, with lean beef, lowfat cheeses and spinach. Recipe and pics to come!